A few days before my birthday I decided to undergo mammogram screening upon the recommendation of my doctor at East Avenue Medical Center. I was worried about the possible “side effects” of Visanne to treat my endometriosis which I’m taking for nearly two months now, so I asked my doctor if she could give me a go-signal to undergo mammogram. The whole procedure was not a walk in the park, I felt pain during and a few days after the procedure, which was only relieved by taking pain reliever. 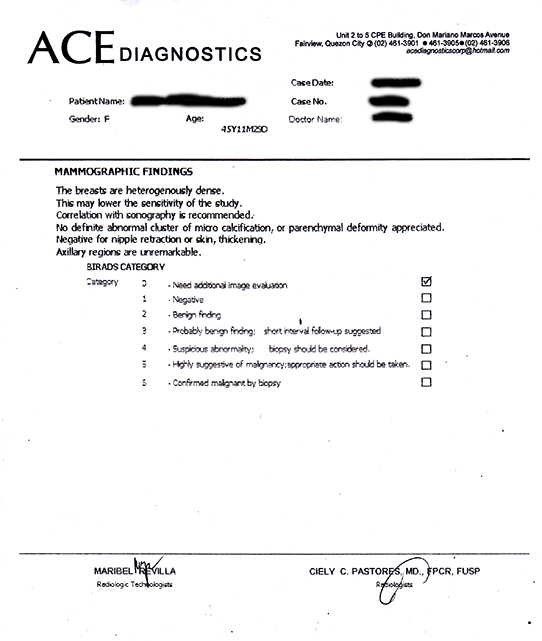 The doctor broke the good news on my birthday, she said the result is negative and that I have nothing to worry about. It was a happy birthday indeed! The best gift ever! Praise God! This entry was posted in Medicine and tagged mammogram findings, mammogram procedure, mammogram test, negative result on May 18, 2016 by Yami.